A very long time customer and friend of mine wanted to get his nearly 20 year old sound system up to date. 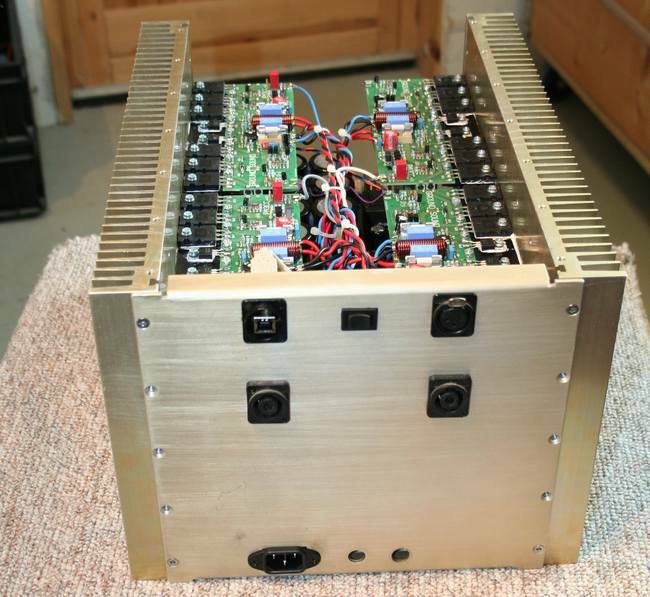 I (Robert) have made a lot of loudspeakers and amplifiers for Bjørn over the years. 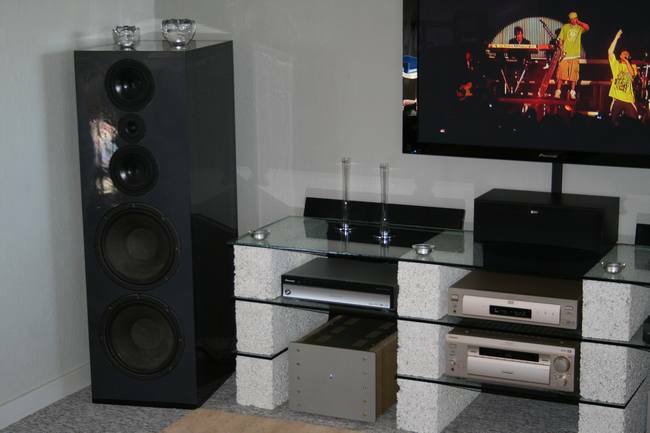 His system in his living room is no exception. 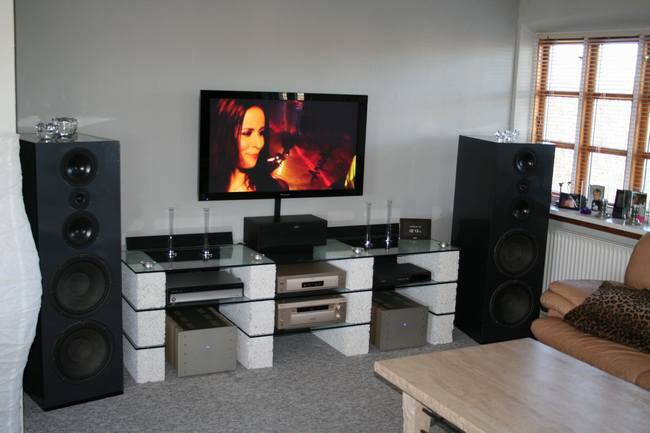 The loudspeakers are a mix of HiFi drivers and PRO drivers, which should fulfil Bjørn's requirements of soft and detailed top and strong, punchy and defined bass reproduction. With these requirements we had to make the system active and the drivers was chosen to be Vifa 1" dome tweeter, Vifa 6" midranges and RCF 12" basses (L12P300). The midranges are placed in a D'Appolito coupling and closed box. The 12" enclosure is ported and tuned around 40Hz as I recall. 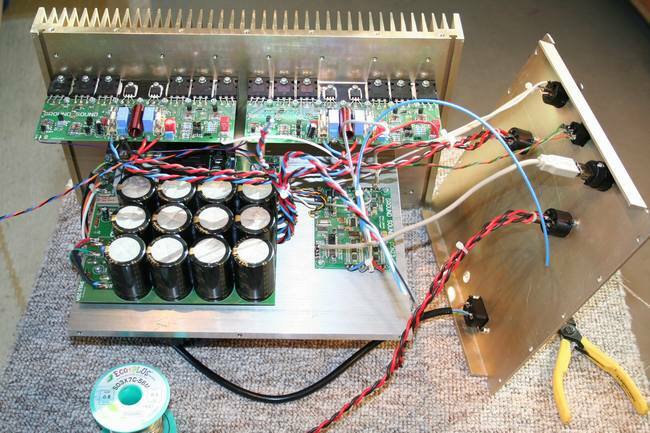 Until now the loudspeakers have been powered by a very old set of power amplifier built by me in the late 80'ies for one of my own loudspeakers back then. 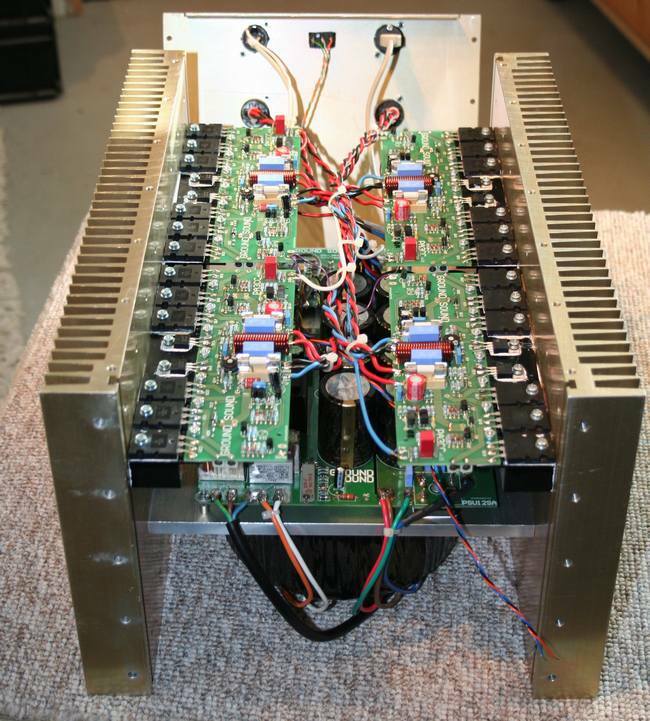 The old power amplifier modules were equipped with TO-3 metal output devices and lack muting control - so they wasn't direct usable for the upgrade and took up a lot of space. 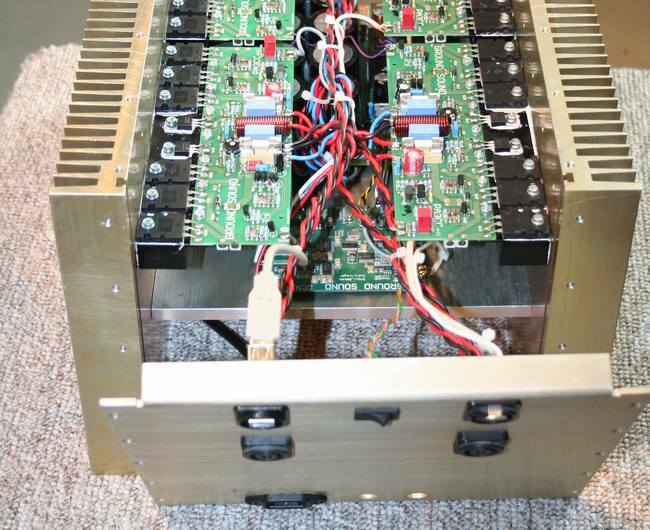 The active crossover units have varied over the years and have included an early generation Lab.Gruppen ACN3, Behringer DCX2496 (recommended by me and I am not proud as it quickly began to behave badly in addition to the relative high noisefloor...!). The latest setup was using a Lab.Gruppen ACN3 of the latest generation. Well now it was time make improvements to the aging system and the hum of the 1200VA UI transformer have increased to annoying levels. After a short discussion of possibilities of the upgrades it was decided for an Active Ground Sound solution. We made a new central aluminium sheet for the power supply TR1000VA transformer, the PSU12SA and the digital crossover DCN23. We choose 4 pcs PA3CC first generation as power units as this would be the optimum of mechanical mounting, electrical load and thermal dissipation and still keep the cost down while maintaining sound quality. The chassis itself only had to be modified a little an extra hole in the front for the standby LED and on the back a square hole for the operation switch ON/OFF/AUTO. Another fun project that Bjørn wanted me to make a very long time ago was a sound system in his HiAce. We ended up removing the original wall and making a complete new wall of sound. I was able to fit 4 pcs RCF 15" PRO drivers at the bottom of the wall using the whole car as enclosure for the bass section...! I also fitted 4 pcs 6" RCF and RCF tweeters. 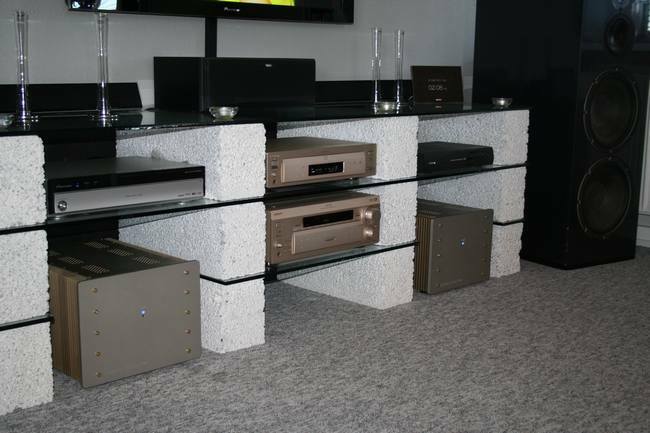 The whole system was active, of course, powered with at the time top notch Phoenix Gold electronics (MS2250 for the bass). Although the system could play very loud the focus was still on the sound and the sound quality was amazing - well balanced tonally and very clear sound stage. A reporter at a car show was also amazed by the sound quality and came back several times comparing it with other systems. Even if the system didn't had the highest SPL - no dB drag racer - the system had his attention and he wanted to make an article about Bjørns car, but Bjørn wasn't willing to display it in a magazine. Unfortunately no pictures were taken by any of us. Using the XOverWizard II advanced software made the setup easy, precise and fast. Below you can see the flat response from both the left and the right loudspeaker - both speakers are measured with the same setup file and about the same distance of about 1m. If you take a closer look at the two curves you will discover that the room / loudspeaker placement affects the response below 500Hz as usual. After making a flat response on the old loudspeakers and listening to the new setup it was clear something had happened - the top and midrange were much better than ever before - it revealed new details in the music that couldn't bee heard in old power line and remember that nothing had been done to the loudspeaker itself. BUT as expected we had to look at the bass response - it simply wasn't as strong and physical as Bjørn likes it. The level of the bass was increased about 6dB and a 2 order low shelving filter was added from 100Hz with a gain of 3dB. Now you think he is crazy and he's might be a little bit... BUT now that we have control of the room modes that have been dominating the bass reproduction earlier it's a bit too flat and lacked presence. For my personal taste I would probably reduce the gain to 3dB and keep the low shelving filter at the same level. Audio DVD on the screen, but Bjørn mostly listens in stereo.